Rare Aircraft – Mountains and Savannas | Achtung, Skyhawk! There is a well established procedure among aviation enthusiasts of visiting an airshow simply to see one or two interesting aircraft types. I myself am guilty of this as well, often going to regional shows (ones not far enough away to be expensive) just for the sake of enjoying the sight and sound of a handful of rarities :). While larger shows such as Air Power in Austria and Kecskemet in Hungary have a lot of interesting jets and piston props to offer, back in June I’d set my sights slightly lower and popped ’round to the small air meet at Zvekovac airfield (LDZE), just a 20 minute hop by Skyhawk from Zagreb. While most of the aircraft in attendance were quite familiar to me – having flown on roughly a fourth of them 😀 – one visitor in particular had piqued my interest ever since I saw it on the guest list: the diminutive Fuji FA-200 Aero Subaru :). One of the very few light aircraft designed and produced by the Japanese aviation industry, the FA-200 is quite an odd machine, examples of which can in Europe be counted on the fingers of one hand. 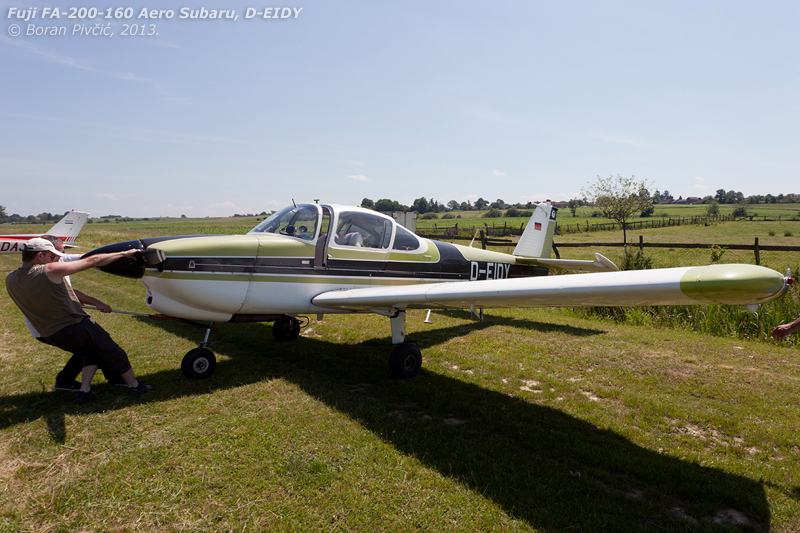 First conceived in the mid-60s – and reminiscent in concept to the Yakovlev Yak-18T – the Aero Subaru is a comfortable and spacious four-seat tourer – and at the same time an aerobatic-capable trainer. To add to this technically challenging mix, the design sports a 400 kg payload, on par even with some larger and more powerful tourers. 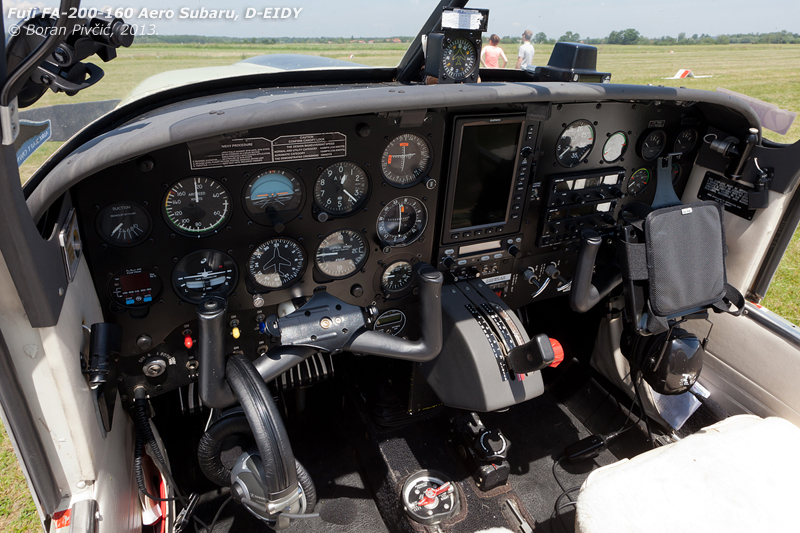 Relying more on aerodynamic efficiency than outright brute force, the design in its basic form – the FA-200-160 seen here – is powered by a 160 HP Lycoming O-320 driving a fixed pitch propeller, a setup nicked directly from the Piper Warrior (and/or Cessna Skyhawk). While this power is perfectly adequate for most needs, it did leave something to be desired in the aerobatic role, leading Fuji to introduce the more potent FA-200-180, powered by the 180 HP Lycoming IO-360 linked with a constant speed prop. Interestingly, the subsequent version – the FA-200-180AO – had kept the engine, but reverted once again to a fixed pitch prop, ostensibly to reduce costs and simplify maintenance. In most other respects a solid design – done in the best tradition of Japanese heavy industry – the Aero Subaru had nevertheless failed to even dent the Big Three’s dominance in the GA market, ending its production run with just 275 examples built across all three versions. While on par in terms of quality with offerings from Beech, Cessna and Piper, the FA-200 lacked that “manufacturer’s prestige”, making it a risky choice from a company with little experience in general aviation and a virtually non-existent support network. However, despite these issues, several examples had made it out of Japan and are still happily flying all over the world 🙂 (with most of Europe’s examples concentrated in Hungary). The same fate however had not befallen another interesting aircraft at the meet (which I’d stumbled upon quite by accident! ): the ICP MXP-740 Savannah XL VG :). A name that will leave you short of breath during any attempt to pronounce it out loud, the MXP-740 is one of several spin-offs of the Zenair CH-701, an amazing STOL homebuilt ultralight whose takeoff and landing performance could have very well qualified it as a helicopter :D.
While not a rare design in itself, the Savannah always warrants at least some attention – especially in this, the XL VG version on which the ICP people had really pushed the boat out :). The XL is pretty much self-explanatory; the VG however refers to vortex generators, small strips of metal on the upper wing surface specifically designed to disrupt the flow of air along the wing. Though this seems somewhat counterproductive, there is a finer underlying logic to it. As with any fluid flowing along any surface, the airflow in the first inch or so above the wing forms what is known as the boundary layer, a thin area in which the flow speed drops due to air viscosity and surface friction. The behavior of the air in this layer is of great importance for the generation of lift, and is described using two terms: laminar flow and turbulent flow. As its name suggests, the laminar flow is smooth (and silky :D), flowing straight and true with no mixing or significant lateral speed or direction changes. This type of flow creates the least drag, which has made it a must for high performance aircraft – and especially gliders! – but requires a clean and smooth wing with no lumps or bumps :). The turbulent flow on the other hand is as chaotic as it sounds, constantly being in a state of mix and suffering from continuous speed and direction changes – which, naturally, considerably increases drag. However, due to these characteristics, the turbulent flow sticks to the wing down more of its length, effectively increasing the wing area producing useful lift. This means that for the same wing area, the turbulent flow will create more lift than a laminar one; or, turning the premise around, the turbulent flow will create the same lift at a significantly lower speed. 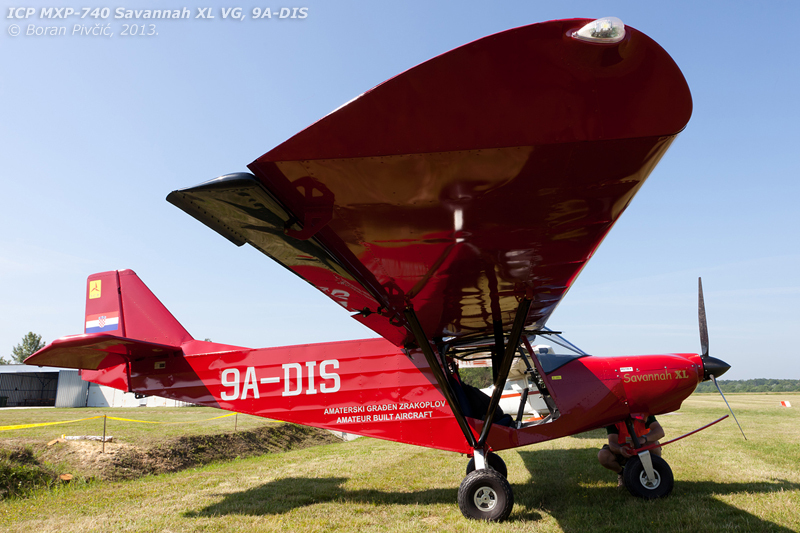 This is of course beneficial to STOL aircraft and trainers – and is one of the reasons why many light aircraft use dome instead of flush rivets on the wings and fuselage, which act as ready-made obstructions and prevent the formation of a laminar flow. However, they can only do so much, so on aircraft that really need proper low-speed handling, they are supplemented by “full blown” vortex generators :). In concert with the thick low-speed wing, slotted flaps and slotted flaperons – ailerons that droop along with the flaps – these vortex generators give the Savannah a comically low stall speed of just 25 knots :). And with its MTOW of 560 kg pulled along by a 100 HP Rotax 912ULS engine, 9A-DIS can become airborne in just 35 meters (115 ft), with 50 meters (164 ft) needed to land and come to a halt.